PIKETON, Ohio – Current and future fish farmers who’ve attended aquaculture programing taught by researchers from Ohio State University’s College of Food, Agricultural, and Environmental Sciences say the techniques they learned not only increased their overall knowledge of the industry but also increased their confidence to work in this industry, according to a recent survey. In fact, some participants said the training taught them important concepts such as how to operate a successful fish farm and helped them clarify potential obstacles to running a successful aquaponics business, said Estefania James, program coordinator for the Aquaculture Boot Camp. The program is offered by the Ohio Center for Aquaculture Research and Development at the Ohio State University South Centers. The OSU South Centers are part of the college. 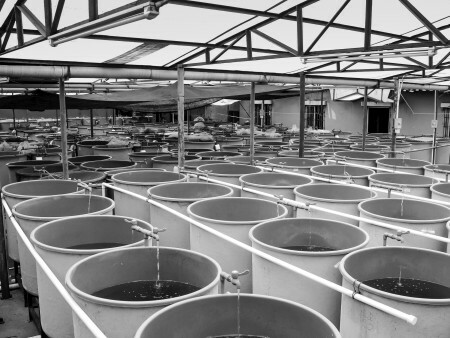 The survey is based on a two-day aquaponics program offered jointly last April by OSU South Centers and the College of Agriculture, Food Science and Sustainable Systems Aquaculture Research Center at Kentucky State University. A majority of participants, 86 percent, said the training offered there increased their skills and taught them successful strategies on how to work with both aquaponics suppliers and customers, which is key to operating a strong fish farm, James said. The workshop is just one of several training opportunities offered for current and future fish farmers at the OSU South Centers. The Centers also offers an Aquaculture Boot Camp, which provides 25 new and beginning fish farmers a hands-on approach to aquaculture and the business of fish farming through a year-long program that gives participants the opportunity to study this agricultural sector at the Piketon facility. “We encourage our aquaculture boot camp students to actively network with new instructors and aquaculture farmers, so this workshop was a great opportunity to establish new contacts and potential business partnerships,” James said. Aquaculture -- which includes the breeding, rearing and harvesting of plants and animals in ponds, rivers, lakes and the ocean for food, sport, bait, ornamental fish, sea vegetables, fish eggs and algae -- is a strong and growing industry thanks to the increasing demand from consumers looking for healthier food options, organizers said. In Ohio, there are about 200 fish farmers registered statewide, according to a 2010 survey by Laura Tiu, a researcher at the OSU South Centers. And many of them say they’d like to gain additional training in new and innovative production techniques, according to the survey. During the boot camp, participants take part in 12, one-day training sessions that include workshops on aquaculture, farm tours, homework and study assignments, and the opportunity to work on an operating fish farm. Students end the program with a complete business plan for their operation, James said. And participants also have access to trainers and mentors in the field. For more information on aquaculture programs offered at OSU South Centers, contact James at 740-289-2071 or 800-297-2072, ext. 127, or email james.742@osu.edu.